North Cascades National Park is a U.S. National Park located in the state of Washington. The park is the largest of the three National Park Service units that comprise the North Cascades National Park Service Complex. Several national wilderness areas and British Columbia parkland adjoin the National Park. 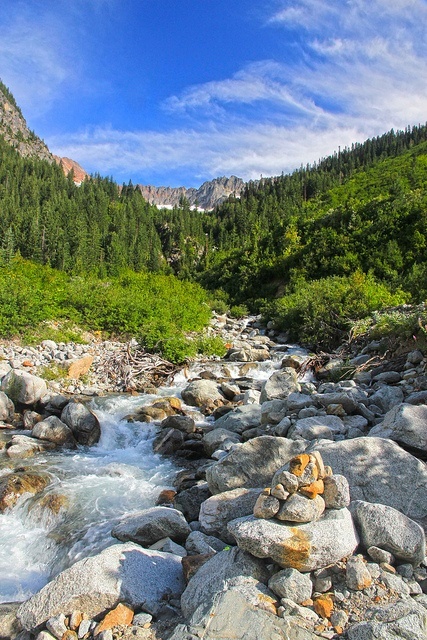 The park features rugged mountain peaks and protects portions of the North Cascades range.In 1971, the park had 318 glaciers with an area of 117 km2 (Post et al., 1971), the most of any US park outside Alaska. All the glaciers in the park have retreated significantly from 1980 to 2005 and the rate is increasing. The recent warmer climate has led to more summer melting and more winter melting events, reducing winter snowpack. Several glaciers in the range have melted away in the last decade.Boston Glacier, on the north slope of Boston Peak, is the largest glacier in the park with an area of 7 km2.